Graveside services for Marjorie Gaines Koelling McCardell, 93, Lawrence, KS, will be held at 1 p.m. Saturday, January 5, 2013 at Memorial Park Cemetery in Lawrence. 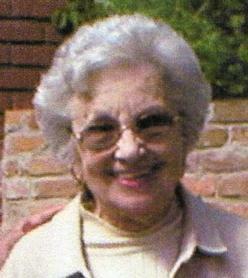 She left this life on Tuesday, January 01, 2013 at Bridge Haven Memory Care Residence in Lawrence. She was born on January 20, 1919 in Butler, MO, the daughter of Leo Lloyd and Ethel Coonrod Gaines. Marjorie was a graduate of the University of Kansas with a B.A. in Journalism. She was a lifelong avid Jayhawk fan. She was a member of the PEO Sisterhood in Newton, IA and was a member of the Alpha Chi Omega Social Sorority at KU. She was married to Edmund A. McCardell who preceded her in death in 2004. Survivors include a daughter, Sue Mohr of Lawrence, a son, Ron (wife, Kay) Koelling, of Bella Vista, AR, a sister Boo Gibson of Jewell, KS, four grandchildren, (Darby (husband, Scott) Zaremba, Wendy Marshall, Robyn (husband, Jon) Hurst, and Tiffany (husband, Michael) Bragdell and two great grandchildren, Regan and Lane Zaremba. She was preceded in death by her parents and two sisters (Rosemary Nelson and June McMillin). The family will greet friends from 7-8:30 p.m. Friday at Warren-McElwain Mortuary in Lawrence. In lieu of flowers, the family suggests memorials in her name to Bridge Haven Memory Care Residence or to the Jasper County Animal Rescue League and Humane Society of Newton, IA. Those memorials may be sent in care of Warren-McElwain Mortuary.